Send this deluxe gift basket online as a wedding day gift, an anniversary gift basket or a romantic gift basket for wife or significant other. This wonderful selection of stunning gifts and gourmet goodies includes an assortment of keepsake gifts, snacks, sweets and indulgent spa products. Basket includes a very soft, plush a 14" teddy bear plus a 12" bear cub, Souleve Spa Body Butter, a satin eye mask, a collectors tin filled with one pound of assorted Danish Butter Cookies, delicious Chocolate Almond Roca, White Fudge Popcorn mixed with Cranberries, Chocolate Caramel Nut Clusters, Cookies and Cream Crunchers, assorted Chocolate Cookies, Dark Chocolate Cream filled Butter Wafer Cookies, Dark Chocolate Raspberry Cream filled Wafer Cookies, Chocolate Cherries, Walkers Shortbread Petticoat Tails, English Almond Toffee with mini hammer for breaking up the candy, Chocolate covered Pretzels, assorted fine Chocolates, Butter flavored gourmet Crackers, Vegetable Cheese Spread, and Wisconsin Swiss Cheese. 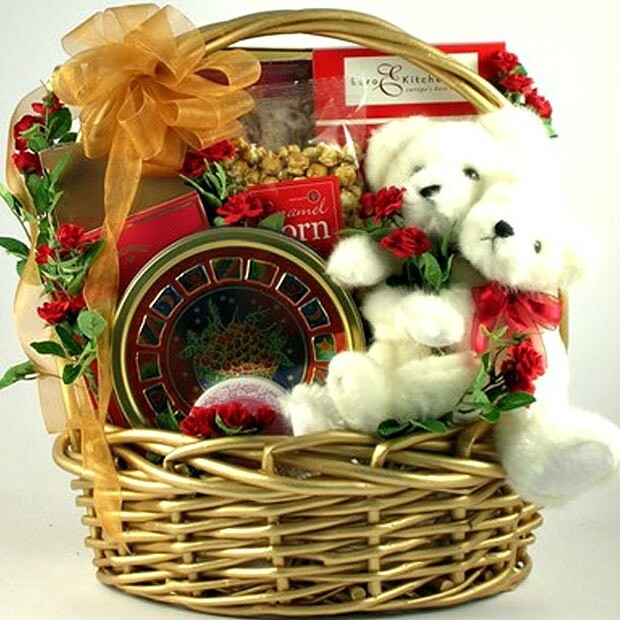 This large selection offers wonderful keepsake gifts, pampering spa products and beautiful silk roses, all artfully arranged in an over sized, handcrafted willow basket painted in shimmering gold!